PRESCRIPTION drugs have featured on more death certificates than illicit drugs over the last ten years, The Detail can reveal. Reacting to the findings a Northern Ireland coroner has said that if members of the public do not listen to warnings about the dangers of prescription drugs, the death toll will continue to rise. In his first interview since taking up his post as coroner nine months ago, Joe McCrisken said the volume of inquests he has held involving prescription drugs deaths was “of real concern and a huge worry”. The Detail has also analysed data over a ten year period in Northern Ireland where illegal drugs or prescriptions drugs were mentioned on a person’s death certificate and therefore were a contributory factor in the death. The figures show that Diazepam, which is largely used as anti-anxiety medication, featured on more death certificates than any other drug - 342 times between 2006 and 2010. The PSNI said there continues to be a significant amount of prescription medication, particularly diazepam, being brought into Northern Ireland illegally on a weekly basis. The data on death certificates is held by the Northern Ireland Statistics and Research Agency (NISRA). Where a drug is mentioned as being present on a death certificate, this does not necessarily indicate it was the primary responsibility for death as it could also have been listed as a contributory cause. The figures show that the painkiller Tramadol was the second most common drug to feature on death certificates over the last ten years. It along with a number of other prescription drugs, have been the subject of a number of high profile inquests carried out in Northern Ireland in recent months. Commenting on the NISRA figures, Mr McCrisken said: “I think people can have a mindset that prescription drugs are prescribed by doctors on a daily basis so they can’t be bad for them. So I’m concerned that the label of prescription drug gives people a false sense of confidence. Mr McCrisken has provided details of a number of prescription drug inquests he has heard, including the case of one individual who ingested a cocktail of prescription drugs from a “pick and mix” style bowl beside their bed. The coroner has also expressed frustration that despite widespread media coverage of several high profile prescription drug inquests, similar cases continue to reach his office. Meanwhile representatives from the British Medical Association have acknowledged the problems associated with the abuse of prescription medication but said it is also important to highlight the legitimate and responsible uses for prescription medication such as for pain relief. The British Medical Association advises that you should not stop taking prescribed medication or adjust your dosage without consulting your GP. Department of Health figures show that almost 40 million medical items are prescribed in Northern Ireland on an annual basis. A previous investigation by The Detail examined millions of prescription records from across the UK, including 3.5 million prescriptions written by GPs in Northern Ireland over a six month period. The Script Report found that Northern Ireland had one of the world’s highest prescription rates for antidepressant medicines. As part of our latest investigation we have looked at data covering the last ten years where drugs have been mentioned on people’s death certificates. The table below features the top ten most common drugs mentioned on death certificates, for drug related deaths, in Northern Ireland between 2006-15. The figures do not specify if the drugs were the primary or secondary cause of death or if more than one drug was mentioned on the same death certificate. This data shows that Diazepam, prescribed to reduce anxiety and tension and legally available on prescription only, featured on more drug related death certificates in Northern Ireland than any other drug. Commenting on the high number of diazepam cases Mr McCrisken said: “I actually think those figures probably underplay the role of benzodiazepines, such as diazepam, in deaths. Mr McCrisken added: “In that case Diazepam didn’t go onto the death certificate, the death certificate simply stated hanging. “Diazepam will be picked up in the toxicology report, it will be picked up in the post-mortem, but it won’t be recorded on the death certificate as cause of death. As part of a previous investigation published in 2011, The Detail looked at the side effects of withdrawal from the painkiller Tramadol. 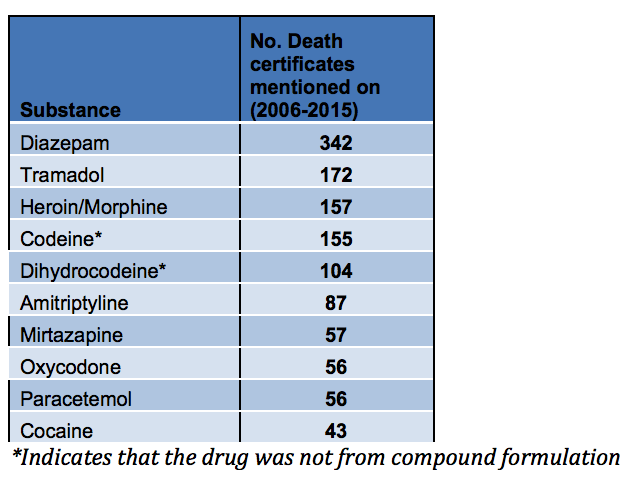 The latest figures analysed by The Detail show that Tramadol was the second most common drug to feature on death certificates over the last ten years. In July this year Mr McCrisken held three inquests on the same day involving the drug Tramadol. The inquests heard how the controlled medication, which is usually given after surgery, is being sold illegally on for as little as £1 per tablet on the street. Speaking to The Detail about the use of Tramadol, Mr McCrisken said: “This is a drug that is strong and freely available. I’ve since held another inquest where a lady had taken Tramadol as well as other prescription drugs. Essentially she had no idea that this drug was so dangerous and so risky to her life because she was prescribed it by a doctor. Tramadol was reclassified in 2014 making it an illegal Class C drug without prescription. Mr McCrisken confirmed that he has written to Northern Ireland’s Chief Medical Officer Dr Michael McBride outlining his belief that Tramadol should be re-classified as a Class A drug. If you are found illegally in possession of a class A drug you can face up to seven years in prison as well as an unlimited fine. Mr McCrisken said he also had growing concerns about the abuse of anti-seizure medication Pregabalin. The figures obtained by The Detail show that this drug has appeared on 13 death certificates since 2013. Commenting on the figures, Mr McCrisken said: “Pregabalin is a relatively new drug in terms of occurrences of deaths but it’s one I’ve been aware of since I started this role. Alex Bunting from Addiction NI said he has noticed an increase in people contacting the organisation about prescription drug use. He said: “I believe the issue of prescription drug use is underpinned by an unhealthy culture that exists in Northern Ireland. We have an environment where patients often go into see a doctor almost expecting a prescription to be given. There is a mindset that these drugs are safe, whereas in fact if not used as prescribed can be extremely dangerous. Dr Alan Stout, GP and vice chair of the Northern Ireland General Practitioners Committee acknowledged the high rate of prescription drug use here but said it was important to remember the valid reasons people can be prescribed such drugs. He said: “In many cases these drugs are prescribed legitimately to people who have a genuine need for them and for whom it will be part of an overall illness or pain management plan. These patients will be carefully monitored and their medication use will be reviewed on a regular basis. “However there is no doubt that the illegal ‘trade’ in prescription drugs is on the rise. General practitioners are under huge pressure in terms of increasing workload and growing patient lists. Mr McCrisken agreed that very often GPs can be put in a difficult position. He said: “Certainly giving people more and more drugs can’t be the answer to problems we face, there has to be a wider look at this. Mr McCrisken said he wanted to get issues that were of wider public concern into the public domain. He pointed to the recurring theme of individuals who have overdosed on opioids, such as Tramadol, snoring shortly before death. He said: “Some drugs affect your brain’s function to control your breathing. Snoring is the best type of indication of some type of ongoing opioid toxicity. It happens with heroin, morphine and Tramadol. “In hospital it would be picked up hopefully, but I’ve held at least five inquests dealing with a death of opioid toxicity at home and in all cases there has been this element of snoring. The family have just not realised, and why would you of course, the person has gone to bed they’ve heard them snoring and simply don’t know there was an issue. Mr McCrisken admitted that despite the high profile reports of deaths related to prescription drugs, he remains frustrated that prescription drugs are still causing deaths in Northern Ireland. He said: “I had an inquest where the deceased had a bowl beside his bed in what looked like a pick n’mix of prescription drugs. He was simply putting his hand into the bowl and taking these drugs as if they were sweets and he isn’t the only one doing that. “In July this year I held three inquests back to back about the dangers of Tramadol, it was front page of the papers the next day. “I was on call coroner that weekend, and on Sunday morning I got a call about someone who had taken a cocktail of the same drugs that had been reported on. Earlier this week the Department of Health issued a warning highlighting the continuing dangers of using prescription medicines from illicit sources.